Cascade Whitebait Company buying and selling West Coast whitebait since 1940. Cascade Whitebait can reach their end destination within 24 hours, whitebait are packed and shipped all over New Zealand. The Cascade Whitebait Company had its beginnings in the mid 1940's. Firstly Ted, then Bruce, Buchanan went fishing with Ted Schofield at "The Junction" approximately 10 miles up the Cascade River. The whitebait was packed out on horseback, taking around eight hours to get to the Nolan whitebait-canning factory at Okuru. In 1949 the extended Buchanan and Eggeling families launched a nine metre fishing boat "Cascade" which was used to transport men and supplies over the Cascade bar and whitebait out to Jackson Bay. Braving the hazardous Cascade bar was not for the fainthearted and the family looked for a more reliable way of transporting their catch. At the beginning of the 1951 season they walked and swam three clydesdales down the river to the mouth-Mary, Bob and Pride. Whenever fishing allowed the horses were harnessed to scoops and the backbreaking work of levelling the thickly flaxed dunes around their hut would continue. 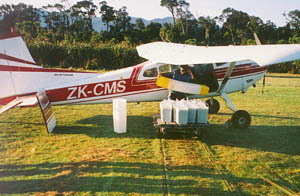 After three seasons and several extra efforts throughout the year the Cascade airstrip was ready for the first landing. In August 1954 a Miles Messenger flown by Des Nolan achieved this and marked the beginning of airfreighting whitebait from the Cascade River. In 1956 Bevan Nolan joined the company and later became responsible for marketing whitebait all over New Zealand. During the 1960's the Roulston family also joined the company. Today the children of the Buchanan brothers, with others, manage the company. Only the youngest original Buchanan brother, Ted survives. Grandchildren are also becoming full time whitebaiters. With time has come development of buildings and machinery. Whitebait is now caught and chilled almost immediately. It is then packed and flown to Christchurch to reach the markets in the very best condition. Today fishermen erect their stands in late August ready for opening day on the 1st of September. Fishermen fish their stands come rain, wind or shine for six hours of the incoming tide before lifting their net and returning with their catch to the camp. The whitebait are quickly "sorted" before being chilled in drainer buckets to allow water to escape. 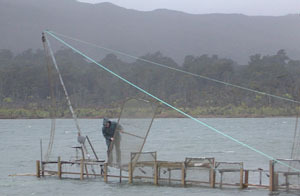 As soon as weather allows the whitebait are flown to the depot at Waiatoto, Haast. Canterbury weather is checked and any whitebait bought from fishermen caught on other Haast rivers are added before the plane is flown to the Christchurch retail outlet. Cascade Whitebait has been buying whitebait from other rivers on the Westcoast since the early 1950's. The base for this arm of the business was initially called Jackson Bay Whitebait Company but is now fully integrated with the Cascade brand. 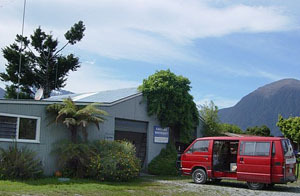 Initially run by extended family, the Waiatoto premises have been ably managed by Jan and Peter Hood for the last 26 years. As well as buying whitebait from local fishermen they also service the Cascade plane, keep in regular radio contact with Cascade and the plane, organise groceries and supplies for the Cascade camp, and keep in contact with the Christchurch distribution outlet. 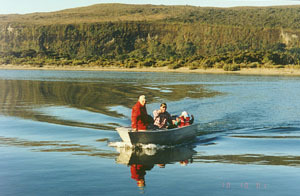 Their experience and expertise helps ensure the fish are at their very best quality on reaching Christchurch. Historically whitebait was sold through the Ferrons fish market to local retailers in Christchurch and beyond. Today Cascade Whitebait has a dedicated premises where the whitebait are packed to retailers requirements and shipped all over New Zealand. Whitebait can reach their end destination within 24 hours ensuring the product you are buying is of premium quality. 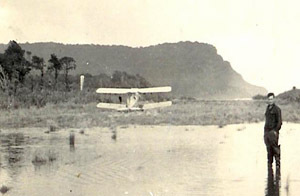 In August 1954 a Miles Messenger flown by Des Nolan landed on the Cascade airstrip marking the beginning of airfreighting whitebait from the Cascade River. Fishermen fish their stands come rain, wind or shine for six hours of the incoming tide before lifting their net and returning with their catch to the camp. West Coast South Island New Zealand.